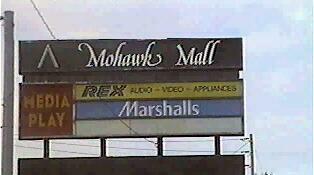 My family shopped at Mohawk Mall throughout my childhood, during the mall's heydey from 1973 until 1983. At the time, it was a current and exciting place to shop. It was far livelier than downtown Schenectady, and it was so much closer to Schenectady than the other suburban alternatives, Colonie Center and later Clifton Country Mall/Clifton Park Center. The mall was originally anchored by a J.M. Field department store, Pantry Pride (a grocery-store annex to J.M. Field -- its parent owned both), Woolworth, The Boston Store, and Montgomery Ward. The mall's cinema originally featured a whopping two screens. In the late 1970s, J.M. Field and its corporate siblings ceased operation. The Mohawk Mall department-store space was occupied by Bradlee's, and the grocery-store space was occupied by Price Chopper. After Crossgates mall opened in 1984 and Rotterdam Square Mall opened in the late 1980s, Mohawk Mall went into steady decline. The site had ample space for upgrade and expansion, but Wilmorite made only token efforts to upgrade or rejuvenate the mall. Wilmorite also owns Rotterdam Square, and apparently it was only willing to invest in one of the two malls. The Boston Store was replaced by Addis & Dey around 1990, and that store was closed in 1993. The space was filled briefly by Interstate Department Store and then Media Play. The original cinema was first expanded to three screens; the third theater had been a fitness club, and it had an awkward separate entrance and concession stand. The cinema had seven screens when Loews closed it around 1999. When I visited the mall around 2000 after a long absence, my first observation was that the tile floors had been replaced by tacky gray carpeting and the mall's 1970s decor had been cheaply obscured with paint or wallboard. The portion of the complex that remained open looked like a cheap office building or a third-rate airport terminal. Mohawk Mall was an inviting place to shop in its early days, but in the end it was almost obscenely derelict -- what a sad ending to a modest mall that once served its purpose well. I grew up in Schenectady and I frequented Mohawk Mall a lot when it was booming. One fact you guys left out: the mall did have a remodel. It happened in the early 90's. When I was a little kid the mall floors were some sort of a fake pebble stone in a brown color. The mall was very dark but then they did a remodel and made it that light grey that was there when it was torn down. I believe they added the skylights at that time too. With the remodeling, they never redid the fountain areas at either end of the mall and the area in front of Media Play and Marshalls. If you look the picture of the bridge in front of the Montgomery Ward's it had these tall lights with huge lights on top, those used-to be all over the mall hallways before they added the skylights. The entrance where Fays Drugs used to be had a bank, and a random hair salon that my Aunt used-to get her hair done at every Friday. It also had the mall's arcade and a shoe store that had an area in the window where women would try on shoes. I remember playing in that window while my Mom tried on shoes. That hallway also had a Bavarian Pretzel stand and of course "Cosimo's Pizza", and yes it was really called "Cosimo's" not Cosmos (still makes me laugh). And of course, Present Company and the Paper Cutter which when I was a kid was a pretty cool store. At the end was Bradlee's which was a store I never really went into a lot. My relatives lived by their sales, but until a friend of mine worked there when I was in High School, I never really went in. Right in front of Bradlee's there was a small fountain. This, as my Cousins would say, was the place to be. It was where all the "cool" teenagers would hang out. During the 80's it was a place where the good girls from Niskayuna would go to meet the bad boys from Schenectady (very John Hugh's Teen Flick). My cousin said that it was a great place to hang because the arcade was close and you could grab a slice and the Orange Julius stand was close by (which unfortunatly didn't survive the early 90's remodel). The McDonalds that was near Bradlee's was pretty cool too, they had a "Tree Table" which was a large fake tree with a face that used to talk that had a counter around it. You could eat and listen to some crazy tree talk and tell stories. I think the tree was there because that McDonalds, although pretty big for a mall store, didn't have an inside playground. From what I can remember the main hallway at that end had the most traffic. When I was young it had a Woolworth's with a diner, Kay Bee toys, Littman Jewelers (which was added after the remodel, before that it housed an independent dance supply shop), Ormond (a woman's clothing store), The Deb, Friendly's, CVS, Record Town, Footlocker, and there was also an independent woman's clothing store there in the 80's -- all I can remember about it was that the walls were light pink and all the clothes where pastel. Very often the Woolworth's store used-to sponsor a carousel in front of their store. A company would literally come in a set up a carousel in the hallway, after the remodel that stopped. In the middle of the mall in later years Media Play was put in which for a young teenager of the 90's was the absolute coolest place ever. But, for a child of the 80's that center section had a store called The Boston Store. It was a store that served the older crowd. My Aunts used to take me in that store. All I can remember about that store was the bright orange rugs and the walls were covered in silver wallpaper. The fountain in front of the store was where Santa and the Easter Bunny would be. I don't have many memories of the other hallway. I don't know if I just never hung out there or because I always was rushing to the other end. The only stores I remember were Wilson's Leather, a Jazzercise studio, and a store called The Garage (I actually bought purple jeans and a Cross Color outfit there). I think there was a Thing's Remembered kiosk there too. Once you get to the fountain there was some of the most random stores I can remember. The not-so-random stores were to the left which included a pet store and the movie theater. Now when I was really young I saw the movie "Follow that Bird" and my Mom and I had to walk down this winding hallway. When we arrived at the end there was a small box office with a small concession stand. The theater at that time only had two theaters. A couple years later the remodeled that end and added I believe 7 theaters and the two small ones were combined to make one big theater where all the big movies were shown (I think that's where I saw "Honey I Shrunk the Kids"). That large theater was all the way at the end and still had the remnants of the box office and concession stand. The last movie I saw at Mohawk Mall was a midnight showing of "Scream". Now for the most random hallway ever. There was a kids shoe store called The Junior Bootery, a dentist and doctor office, another Jewelry store, Chess King (a store which I still miss to this day), lockers, the mall's only restrooms, a hair salon that was so 70's it was kind of embarrassing, and of course The Ground Round. This hallway was also where the skateboarders would hang out, I saw my first Mohawk ever there. The Ground Round that was in Mohawk Mall was huge. It had main eating area with a large movie screen which if you grew up in the 80's knew that they showed cartoons on. There was a large bar area and the lobby was a mini arcade. I had a lot of great memories in that Ground Round. Although I stopped going to Mohawk Mall when I was an older teen (thanks to a move to Rotterdam and the new mall that was built) the Mohawk Mall has a special place in my heart. There are so many memories there including my first trip to the mall without any supervision and my first date in the 7th grade. I hope this little glimpse into my childhood adds to your already great website. I went to this mall in 2001. At that time, the mall was completely gone exept for Media Play which was preparing to close, Marshalls, and the Rex Tv and Appliance store. In the remaining portion of the hallway there was a plywood board covering what used to be a fountain. The only people that I saw were an elderly couple talking about the mall in It's early days(I tried to catch up to them, but they couldn't hear me), and a kid running across the board covering the old fountain. Soon, the rest of the mall was demolished. A big box center called Mohawk Commons was constructed. The first building to open was a Price Chopper Market Center and a new Marshalls. The project was produced by the Buffalo based Benderson Development Co. Next to be constructed was a Target and Lowes Home Improvement store, which is their second store in the Albany area. Recently, a Bed Bath and Beyond store opened next to Target. Other new stores include Petsmart,a store called Parkway Liqours, Payless Shoes, Supermarket of Shoes,Party City, Eastern Mountain Sports,Cingular Wireless, AT&T Wireless, Ruby Tuesday, Supercuts,Barnes and Noble, Blockbuster Video, Old Navy, Verizon Wireless, and Empire Vision. Construction crews are now working on a new Taco Bell, as well as a Cold Stone Creamery. The project started in late 2001 and is expected to be done in early 2005. The one thing that I find is really cool is that Price Chopper had their store in the mall until the early 90's and opened a new store in 2001. That's an example of retail evolution -- a store opens on a certain property, closes, and then opens again when the property's company reinvents the site. This mall was constructed in 1970, it's purpose wasn't to be as large as Colonie Center, but to offer a newer and closer alternative for an enclosed mall for the residents of Schenectady, Niskayuna, and other surrounding areas. The mall was originally anchored by a Bradlees, Price Chopper, Montgomery Wards, Marshalls, Present Co, and the shortlived "Interstate Department store". Amidst all of these anchors, the mall was still small in size, and in the 1970's that wasn't a problem. The shoppers came in droves. The Mohawk Mall catered to medium sized anchors, which were king of the market until the mid 80's, when they started to lose ground to the big box retailers. The Interstate department store left a void in the mall for quite some time, until the early 90's when Media Play leased the space. This was the last new anchor the Mohawk Mall would ever see. Also, Mohawk Mall lost the Price Chopper store, which they quickly divided up into smaller spaces. Fay's Drugs and the Paper Cutter moved into the newly divided space. Fay's was later aquired by Eckerd, who pulled the pharmacy out of the mall because of competition from the CVS store in the mall. They moved Eckerd's to a nearby plaza. The Paper Cutter folded as well, and Present Co. was mired up in bankruptcy. After those stores closed, traffic to that portion of the mall had decreased, creating a dead spot. In 1984, the Crossgates Mall, a super-regional mall, was constructed, and began to hurt other small malls in the region. small stores in Mohawk Mall suffered, and Bradlee's, the malls last anchor in the west side of the mall, closed a wave of underpreforming stores, included was the Mohawk Mall store. McDonalds and other smaller tenants, seeing the writing on the wall, pulled out as well. By the mid 90's only a Radio Shack, Foot Locker, Cosmo's Pizza, CVS, Friendly's, Gallery 44, Sony Cinemas and Fleet Bank in the mall, excluding the anchors. Low traffic to the mall, caused an exodus of smaller stores. In 1996 Montgomery Ward, closed almost ALL of it's NY state stores, which left only Media Play and Marshalls. The mall, which hadn't received any form of redevelopment since it's opening in 1970 began to look very dated, shoppers avoided the "ghost mall" The few remaining stores threw in the towel the following year. Leaving the mall virtually vacant by 1999. Only the Media Play, Marshalls, Gallery 44 and Rex which wasn't even accessable from the inside of the mall remained. Wilmorite ceased any and all maintenecne of the mall, and allowed it to reek of urine and mold. The roof leaked for years, and plaster fell into the mall, all while the building was still opened to the public. 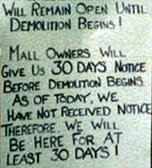 The malls fate was decided, it would be demolished in the fall of 2000. Gallery 44 was ordered to move out, and the 3 remaning anchors remained open while the mall was being demolished around them. The property, which is generally reguarded as an eyesore, still remains in this condition, altough there are plans to begin construction of a big box center in 2001. I recommend everyone stops by, there is still a portion of the mall open to the public (the passageway between marshalls and media play) you can dig the cool 70's stylin. Click here for exclusive deadmalls.com photos of before and during demolition.